What is a carbohydrate controlled diet? Is it like a low sugar diet? Nope, it’s a more liberalized version of the diabetic diet. And I like it, don’t get me wrong. But I also realize it has its limitations. When you are thinking about a carbohydrate controlled diet, you are probably thinking about how you will weigh and measure what you need from a certain type of food to achieve the “golden” number of carbohydrate that you are allowed for the meal. And in practice that’s not how it works. But one of the drawbacks of a carbohydrate controlled diet is that it assumes all carbohydrates are the same. Which they are not. I want you to know about something called the glycemic index. Basically, this is how quickly a food is broken down into carbohydrate and absorbed by your body as “glucose”. Hence the name, glycemic index. So, foods with a low glycemic index take a long time to breakdown into the basic sugars and proteins contained in it. And foods with a high glycemic index breakdown quickly. What is high? The reference is 100, so anything over 70 is high in my book. Where do you find out about glycemic indexes of foods? Check out the information at Wikipedia. So, in general foods with more fiber and less carbohydrate are low glycemic index foods. A slice of wheat versus white bread for example. Wheat bread has a great deal more fiber so it has a lower glycemic index. A piece of white bread is broken down easily and raises your blood sugar quickly. Now a lot of people say that this does not matter in a mixed meal. And I understand their point. But… how many people eat a high fiber meal. The average American meal contains a great deal of processed foods and very little fiber, so you can bet that all of it is being broken down quite readily and absorbed like regular sugar. And what does that have to do with a carbohydrate controlled diet? (you think my tangent was for naught?) A carbohydrate controlled diet only works if you eat high fiber foods all the time. You cannot eat regular sugary foods or high glycemic index foods and expect your sugars to be in control. So, yes a slice of bread that says 15 gm carbohydrate but no fiber is going to be broken down quickly and not stay in your stomach long – which won’t allow you to feel very full. If you eat the same type of food but as a whole wheat product, you will get fiber and feel fuller longer. We are supposed to eat 30 gm of fiber every day. Do you get that much? Let me say again that drinking a glass of juice and eating a fruit both contain the same amount of carbohydrate (4oz juice). But the whole fruit contains fiber and therefore is much better for you as far as controlling your blood sugars and feeling fuller throughout the day. And I feel strongly that all carbohydrate is not the same. Whole grains and whole wheat products that contain fiber will help you feel better and fuller for a longer time. Plus, drinking your carbohydrates – while it may be convenient – is not the same as eating a food that has fiber in it. Until we realize that we have to start eating less processed foods and more fiber we will continue to have the epidemic of obesity. Maybe you should keep a food log and track only the amount of fiber you eat every day. It will surprise you. But the bottom line is this – carbohydrate controlled diets work under certain conditions. If you are able to learn to consume 30 gm or more of fiber a day, and eat only the portions you are allowed as part of your meal plan, you can have radically different control over your meals and diabetes. You can feel fuller because the foods you are eating are not totally sugar or foods that increase your glucose levels quickly. As a diabetic, your goal is to strive for a consistent blood sugar level throughout the day, and not be hungry so you are tempted to snack. A carbohydrate controlled diet goes something like this – eat 60 gm carbohydrate at breakfast, lunch and dinner. It does not tell you what kind nor which types of foods to eat that are best. If you had 60 gm of carbohydrate you might want to think about it like this – 30 gm = 2 slice whole grain toast + 4 gm fiber, 15 gm = 1 cup 2% or less milk, and 15 gm = 1.5 cups of green leafy vegetables. Now you also need to eat meat and some fat. You can have deli meat on this sandwich. So you get 1.5 cups of vegetables – looks like a salad, 1 cup milk, 2 slices bread for your meat. You can have some mustard on the sandwich, and low calorie dressing on your salad. Add some water after you are done with your milk. You just had a great meal. Contrast that with a regular soda and some white bread – 45 gm in soda, 15 gm in 1 slice of white bread. Not nearly as healthy. 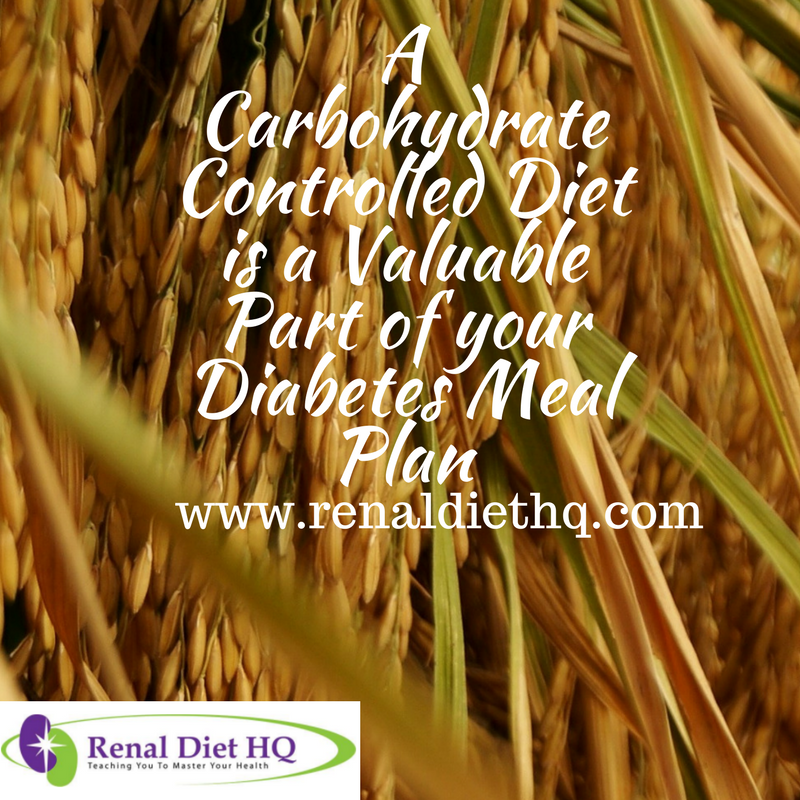 I hope that you have learned a little more about the fact that carbohydrate controlled diets don’t have to be hard to do, you just need to set yourself up for a positive outcome. If you want further help, check out our options for diabetes meal plans.